JASMIN CREEK é filha de REDWOOD CREEK, AAA-93, por Feature Mr Jess. 4 vitórias, U$ 145.000,00 em prêmios; California Hi-Point three year old colt 2006; Superior Race Horce 2006, 3° Los Alamitos Super Derby (G1), Finalista do Golden State Derby(G1), Southern California Derby (G1), El Primero Del Ano Derby (G1), PCQHRA Breeders Derby (G2), etc... Redwood Creek é filho de FEATURE MR JESS, ganhador de mais de US$ 530.000 e produtor de filhos que ganharam mais de US$ 14.000.000. HEARTSWIDEOPEN (AAAT-104, Campeão Mundial, US$ 1,885,683 em premios, 1o. All American Futurity-G1, 1o. Ruidoso Futurity-G1, etc), JESS YOU AND I (AAAT-101, Campeão Mundial, US$ 1,672,017 em premios, 1o. Golden State Million Futurity-G1, 1o. Champion of Champions-G1, 1o. Remington Park Invit. Champ-G1, 1o. 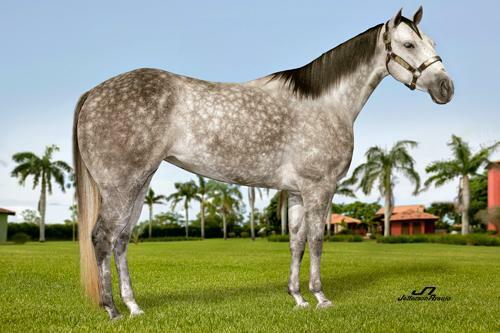 Los Alamitos Winter Champ.-G1, etc), STYLISH JESS BR (AAAT-103, Campeã Mundial, 11 vitórias, US$ 795,542 em premios, 1o. Mildred N Vessels Memorial H.-G1, 1o. AQHA Distaff Challenge Champ.-G1, 1o. Charger Bar H.-G1, etc), JESSANOTHERAFFAIR (AAA- 98, 6 vitórias, $349,336 1º PCQHRA Breeders Derby-G2, 3º Golden State Million Futurity-G1, etc. ), BRENDA BEAUTIFUL (AAAT-110, Campeã Mundial, 4 vitórias, $337,176, 1º Southwest Juvenile Championship-G1, 1º Hobbs America Futurity-G2, etc. ), FEATURE JESS ROCKIN (AAAT-115, 6 vitórias, $289,196, 1º AQHA Challenge Championship-G1, 1º Fair Grounds Challenge S., 1ºSawgrass S., etc. ), JESS DESTINED (AAAT-102, 6 vitórias, $242,523, 1º West Texas Futurity-G1, 1º Lovington H.-G2, etc. ), DIAMOND FOR JESS (AAAT-112, 7 vitórias, $236,113, 1º Remington Park Derby-G2, 1º Sam Houston Derby Challenge-G3, etc. ), SKYLINE LOVER (AAAT-119, 11 vitórias, $213,169, 1º New Mexico Derby Challenge-G3, 1º Slm Big Daddy S., etc. ), RIO ROJO JESS (AAAT-101, 11 vitórias, $188,309, 2º Don Boyd Memorial H., 2º Midwest Maturity, etc. ), etc.